Investment advisors generally say it makes no sense to try and time the market and that a longer-term view is usually the better course of action. In our modern world of volatile markets and 100Y old companies disappearing in an instant during the financial crisis, we are not as convinced. 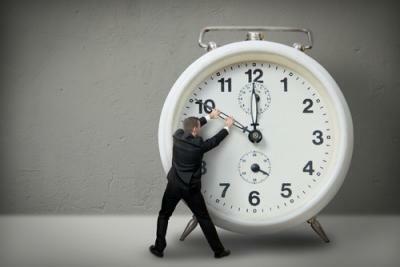 Timing can be important in many endeavors, not the least of which is in loan underwriting. We have discussed the hazards of duration mismatch when pricing longer term fixed rate loans using a spread to short term interest rates. Today we discuss another duration match problem that can show up in commercial real estate (CRE) loans, and that is when there is a match between the expiration of leases on a CRE property and the time for refinance. Many banks run into this problem when they set the maturity of a balloon without knowing the maturity of the leases for a given property. There are all kinds of problems that can arise if the timing is wrong. A loan due to refinance at the same time the property's leases are rolling over (or could go vacant, depending upon demand for space), increases risk and could mean a perfectly good loan could be headed for trouble - simply by the accident of the timing. When underwriting these kinds of loans, officers should look at the lease structure first and then set the maturity accordingly to avoid trouble. If there is a single tenant, this is fairly simple - make the refinance well in advance of the end of the lease. Things get a little trickier if there are numerous leases, but it should be possible to determine a common term. If leases typically roll over every 3Ys, then set the loan maturity for 5Ys so one lease renewal cycle is included but there is plenty of time prior to the second to renegotiate if a future cash flow problem is anticipated. A minimum of 3 months' time between a balloon maturity and the expiration of key leases is recommended as a minimum and 1Y is even better. Another consideration in assessing the timing of lease rollovers has to do with the importance of key tenants. If a shopping center has an anchor tenant like a large grocery store or major retail chain, then the timing of a balloon refinancing should be set to occur before that tenant might refinance their lease or decide to leave. The underwriter should also know if there are options in the lease agreement which allow tenants to leave early. The bank should require notification on whether such options are exercised and in the case of deteriorating market conditions (or a deteriorating property), extra efforts to stay in touch with the borrower and to renegotiate if necessary will go a long way towards protecting the bank from a problem loan. Yet another element important in CRE lending is especially relevant to retail properties like shopping malls. Here, the same customer migration to internet and mobile that is causing banks to reduce branches and staff can also undermine retail providers (both large and small), so be careful. CRE properties have enjoyed a more prosperous time in most areas over the last few years than in those prior. This has caused probabilities of default to drop and lending standards to ease a bit. It's important to remember that economic cycles change and that by historical norms, this period of expanding GDP in the US is getting on the longer side. There may be danger ahead for CRE properties, so bankers should do their homework and carefully consider the structure of underlying leases when determining the maturity date of loans. Doing so will help protect both the bank and your borrower. It's just a matter of good timing and as Benjamin Franklin tells us: lost time is never found again. Yields dropped 7 to 8bps as Treasury market liquidity continued to wane and as the market eyed developments in Greece. The market will make note of existing home sales. 1) Home Bank ($1.2B, LA) will acquire Bank of New Orleans ($330mm, LA) for $74.5mm in cash. A study by Pindrop Security finds 1 in every 2,200 calls made to financial institutions and retailers is fraudulent (up 30% since 2013). 1) Extraco Banks ($1.4B, TX) will acquire a TX branch from Broadway National Bank ($3.3B, TX) for an undisclosed sum. New SEC rules kicked in on Friday that allow small investors to participate in crowdfunding. Under the rules (Regulation A+), securities laws that previously limited crowdfunding to accredited investors (net worth of at least $1mm) are modified. Companies can now raise money from a broader set of investors, provided the company discloses financial results, produces audit reports and meets state and federal requirements. Companies that raise money from non-accredited investors will face registration costs of about $100,000 according to experts, so it may still limit participation depending the amount of money being sought. A survey by Gallup finds 28% of people say they have a great deal or quite a lot of confidence in banks vs. 44% historically. Overall, banks ranked #9 in the list, squished between public schools (31%) and organized labor (24%). At the top of the list were the military (72%), small business (67%), the police (52%), church or organized religion (42%) and the medical system (37%). Meanwhile, Congress came in dead last at only 8%. The SEC has settled with 36 broker dealer firms for allegedly selling municipal bonds using offering documents that contained material omissions and false statements. The firms will pay a total of $9.3mm in penalties. Research by Axiometrics finds the national apartment occupancy rate reached 95.3%, the highest level on record, as rental activity remains robust.